Dice Throne is a fast-paced 2 - 6 player combat game (1v1, 2v2, 3v3, or free-for-all). *Note that the Standard Edition only supports 2-4 players. Select from a variety of heroes that play & feel completely distinct from one another. Attack opponents and activate abilities by rolling your hero's unique set of 5 dice. Accumulate Combat Points and spend them on cards that have a large range of effects, such as granting permanent hero upgrades, applying status effects, and manipulating dice directly (yours, your teammate's, or even your opponent's). 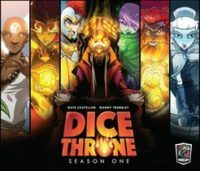 Add a Review for "Dice Throne: Season One"